With the help of superposition, you can break down the complex circuit shown here into two simpler circuits that have just one voltage source each. To turn off a voltage source, you replace it with a short circuit. Circuit A contains two voltage sources, vs1 and vs2, and you want to find the output voltage vo across the 10-kΩ resistor. The next diagram shows the same circuit with one voltage source turned off: Circuit B contains one voltage source, with vs2 turned off and replaced by a short circuit. The output voltage due to vs1 is vo1. Similarly, Circuit C is Circuit A with the other voltage source turned off. Circuit C contains one voltage source, with vs1 replaced by a short circuit. The output voltage due to voltage source vs2 is vo2. 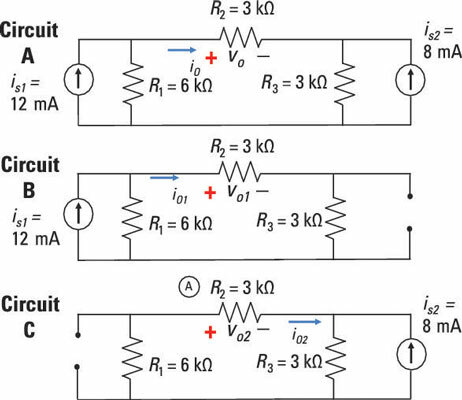 The plan in this section is to reduce the circuit shown here to two simpler circuits, each one having a single current source, and add the outputs using superposition. You consider the outputs from the current sources one at a time, turning off a current source by replacing it with an open circuit. Circuit A consists of two current sources, is1 and is2, and you want to find the output current io flowing through resistor R2. 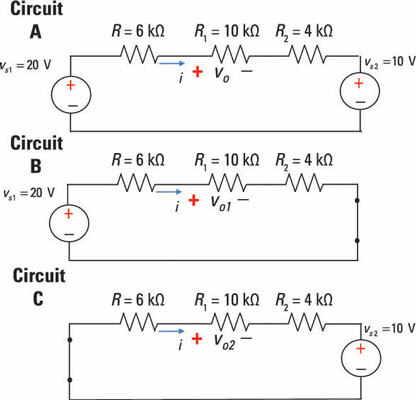 Circuit B is the same circuit with one current source turned off: Circuit B contains one current source, with is2 replaced by an open circuit. The output voltage due to is1 is io1. Similarly, Circuit C is Circuit A with only current source, with is1 replaced by an open circuit. The output current due to current source is2 is io2. To find the output currents for Circuits B and C, you use current divider techniques. 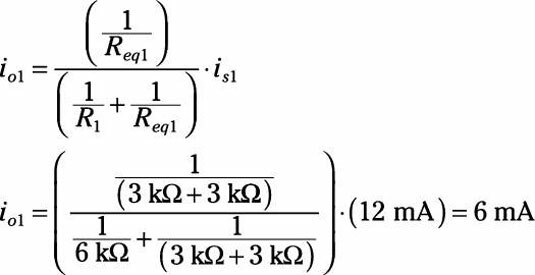 That is, you use the idea that for a parallel circuit, the current source connected in parallel with resistors divides its supplied current proportionally according to the ratio of the value of the conductance to the total conductance. You can use superposition when a circuit has a mixture of two independent sources, with one voltage source and one current source. You need to turn off the independent sources one at a time. To do so, replace the current source with an open circuit and the voltage source with a short circuit. Circuit A of the sample circuit shown here has an independent voltage source and an independent current source. How do you find the output voltage vo as the voltage across resistor R2? Circuit A (with its two independent sources) breaks up into two simpler circuits, B and C, which have just one source each. 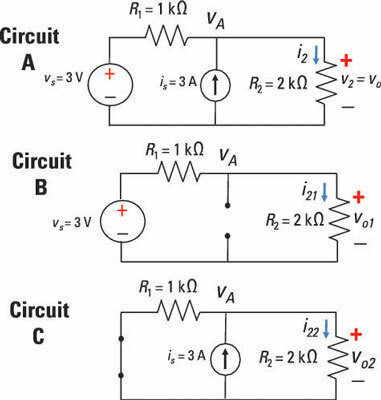 Circuit B has one voltage source because the current source was replaced with an open circuit. Circuit C has one current source because the voltage source was replaced with a short circuit.